The VB56 baling system can reduce waste volumes by up to 90%. It is suitable for cardboard, paper, cans, plastics, shredded papers. It is easy to load by hand from above and has a large disposal/filling aperture. The material is compacted with up to 4.8 tonnes of pressure. 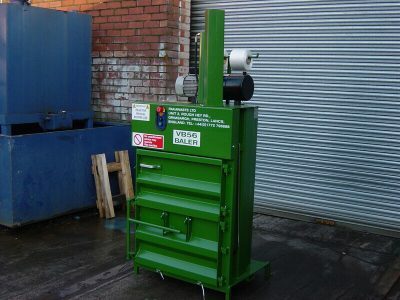 The vb56 vertical baler has a replaceable spring-loaded hold-down device for different types of materials and has a specially designed trolley to ensure bale removal is simple and straight forward and can produce bales of up to 60 kg. The baler has compaction with up to 4.8 tonnes of pressure (47kN) and has a specially designed trolley supplied as well.